By Xah Lee. Date: 2011-10-19 . Last updated: 2011-10-26 . While many tech geekers evoke a feeling of unfairness about why the mob cries a river over the death of Steve Jobs but not Dennis while Dennis did “far more contribution”, but then, have you thought about why you couldn't even name one mathematician who died in the past decade yet whose contribution to mankind far surpass Dennis Ritche? Slightly annoyed by the so many eulogies of Dennis Ritchie from programing geeks (and then the one thousand SEO f￼cking sites trying to make a buck out of it (such as TechCrunch, SearchEngineLand — am nice guy and respect all — scumbags)). So, am about to badmouth this idiot who just died — your hero, who you consider did great contribution to mankind. Are you gonna be offended? Let me give you this perspective. Let's say it's someone you hate, is someone you consider a criminal of mankind, who did massive harm to society in a indirect way. Say, it's George W Bush, or the Catholic Pope, or Bill Gates. Can you see the perspective now? Dennis Ritchie i don't really know what's his character. But i do know that C language, his creation, is one of the most f￼cked up hack. So, recently the LISP language inventor John McCarthy died. 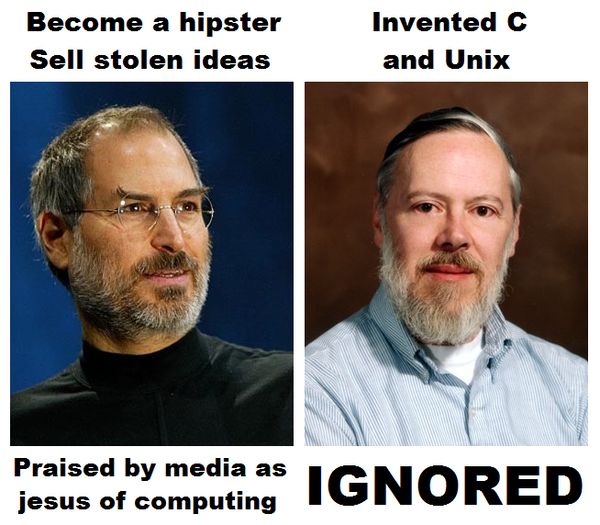 I was curious, and wanted to see if there's much fanfare among coders, who tweeted with a touch of fanaticism about how the C language inventor Dennis Ritchie died and about how he should get much more attention than Steve Jobs. Like, citing about how all the techs in iPhone etc we use that are touched by Ritchie. Indeed, McCarthy didn't get much attention, Ritchie got more, Jobs even more so. While more obscure computer scientists, who didn't “invent a language”, e.g. Edsger W Dijkstra, much less, and mathematicians of the century such as Benoit Mandelbrot, Harold Scott MacDonald Coxeter, whose works are far more important than Ritchie or McCarthy, much less. F￼CK the unix tech geeking scumbags. Why am i angry about this? It is common for the populace to remember pop. Entertainers, such as Michael Jackson, of course gets far more coverage. Same with politicians. And mathematicians who laid the foundation of modern science basically gets no coverage in mainstream media. The level of coverage has to do with popularity (obviously), not in proportion to their contribution to human animals society. This is all rather normal. What i get pissed, is when, loud mouthing unix hacker idiots start to cry certain unfairness. Generally speaking: those who loud-mouth untruths, consciously or unconsciously, yet are adamant in denying that they are doing so. It is this group i despise. Since i'm in the programing community, thus i see the ills of the doings of programers more. In particular, a sub-culture of programers who pride in the term “hackers”. This group often has a sense of righteousness in their opinions and behavior.